Are you ready to turn your vehicle into a mobile station that allows you to connect with truck drivers and other hams on the road? This is easier and more affordable than you may imagine, and it all starts with selecting the best mobile ham radio for your personal needs. The market for mobile ham radios is quite cluttered, and some radios are far more impressive than others. It's difficult to find the best mobile ham radio for the money when you can't try each option out personally, so we created this guide to introduce you to our top picks. 3.4 Is A Mobile Ham Radio Right For You? We have reviewed a long list of mobile transceivers, but there are only five that we would consider naming the best mobile ham radio. We understand that the best radio for you is likely different from the best radio for someone else, so we're including radios with a variety of features and price tags. The TYT TH-9800 quad-band mobile radio gives you full access to UHF and VHF frequencies along with four amateur radio bands. It offers wide-receiver coverage and allows you to save more than 800 of your favorite channels for one-touch tuning. We're impressed that this mobile ham radio sells for less than $300 at full price yet comes with cross-band repeat. This feature allows you to piggyback off transmissions from more powerful radios in your area in order to increase your mobile station's reach. Since tall antennas are sometimes an inconvenience when driving in parking garages and through other low structures, we're happy to see that the antenna included with the TYT TH-9800 folds down easily. It's also quite durable and transmits well, so you may not feel that urge to replace it with a higher-quality antenna. 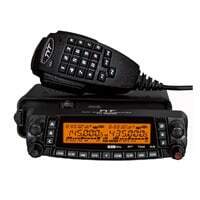 We think that this is an excellent mobile ham radio for the money if you want a system that is easy to use. While programming with a cable isn't efficient with this radio, it is easy to program manually. Since it doesn't come with a programming cable, manual processing will also save you some money. If you're searching for a powerful radio that is easy to use, you may consider the Yaesu FT-7900R a top mobile ham radio for your needs. It's easy to program, and buttons on the front of the console allow you to quickly select between features, power settings and stored channels. There are five power options, including 50 watts of power operating at 144 MHz and 40 watts of power at 430 MHz. The lower power settings are ideal if you don't need to reach a significant distance and don't want to use too much power. The Yaesu FT-7900R is a dual-band mobile ham radio that allows you to pick up weather alerts, FM stations, AM aircraft bands, public safety channels and a wide range of additional bands. This extended capability and the power offered make this mobile radio more than worth the mid-market price range, which is around $300 at full price. The Kenwood TM-281A is an FM transceiver operating at 144 MHz, so it doesn't offer as many channels as a dual-band mobile ham radio. That said, we are impressed that it delivers 65 watts of power and is built to last. This is one durable radio that should hold up to years of consistent use. 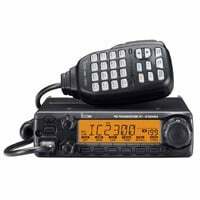 If you're searching for a compact mobile ham radio, you may like that this Kenwood radio is smaller and lighter than many competing mobile radios. The transceiver weighs less than three pounds, but we did find that the mic is a bit heavier than others that we have held. What really impressed us about the Kenwood TM-281A was the clarity of the audio output. If you don't want to fight static and background interference when talking to fellow hams or listening to weather alerts, you will appreciate the high-quality speaker built into this radio. Audio goes two ways, so you should also expect others to hear you clearly when speaking through this radio. Just keep in mind that this system doesn't come with an antenna. While it is an added expense to purchase the antenna separately, it also gives you the opportunity to select an antenna that meets your quality standards. If you're interested in finding a great mobile ham radio for your money, put the BTECH MINI UV-25X4 at the top of your list. It's one of the most affordable mobile ham radios that doesn't lack in features. In fact, it delivers some of the crispest, clearest sound quality that we have found to date. We do want to note that this radio comes only with the transceiver box and the handheld mic. You will need to select a compatible antenna to complete your mobile station. The BTECH MINI UV-25X4 is a tri-band mobile radio that weighs just over two pounds, and it's much smaller than other radios. 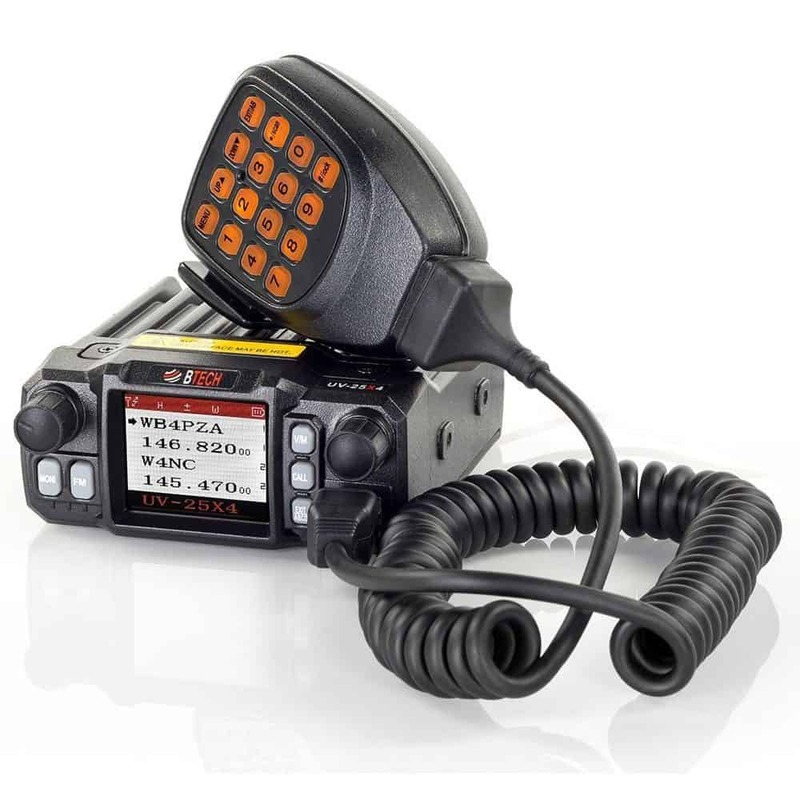 If you don't have much room in your vehicle but don't want to compromise on sound quality and frequency allowance, this is probably the best mobile ham radio for your needs. While many mobile radios now come with poorly written user guides, the manual included with this radio is quite impressive. The radio is also easier to install than larger mobile transceivers, so you may get it up and running faster than you would a competing unit. While we wouldn't necessarily recommend the ICOM 2300H-05 as the best mobile ham radio for the money, it is still one of the best mobile transceivers in terms of power and features. Just keep in mind that it isn't your typical dual-band mobile ham radio. It is an amateur radio operating at 144 MHz with a power output of 65 watts. This radio has a larger display than many other mobile radios, and it allows you to program more than 200 of your favorite channels for fast tuning. We were impressed with the audio quality, which comes through with clarity not offered by many ham radios today. While many amateur and ham radios now come with antennas, the ICOM 2300H-05 only comes with the transceiver box and microphone. The alphanumeric keypad is located on the back of the hand speaker. We would consider this an excellent mobile ham radio in its price range if you didn't have the added expense of buying an antenna. Investing in a good mobile ham radio will allow you to turn your vehicle into a ham shack. 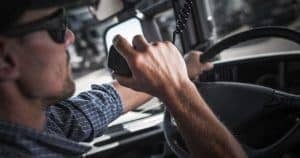 This allows you to communicate with commercial truckers and other drivers with radios on the highway. You may also use your mobile station to talk to other hams in your local area, just as you would from a home base station. 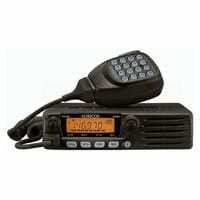 Mobile ham radios often give you a more substantial reach than you would have with a handheld ham radio. This comes partially from the added power that you receive when connecting your radio into your vehicle. You can also attach a larger antenna to your vehicle to substantially increase the power and range over the small antennas on handheld devices. While handheld ham radios often have 5 watts of power, a mobile ham radio can easily have 50 watts of power or more. 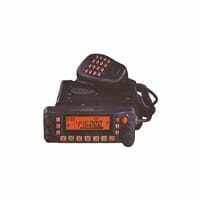 The best mobile ham radios operate with VHF and UHF frequencies. A dual-band mobile ham radio allows you to connect with repeaters in your local area to significantly increase the reach of your transceiver. You may also select a radio with HF mobile bands, which will allow you to communicate with other hams located much further away. These radios are often called "all-band, all-mode" transceivers, and you can expect to pay more due to the extended reach. There is an installation process required for the creation of a mobile station. The exact installation process will depend on a variety of factors, including which mobile ham radio you select and the type of antenna that you want to attach. If you don't know how to install a ham radio into your vehicle, consider hiring a professional to do it for you. There are also guides on many blogs and websites that will help you connect all components of your system quickly and affordably. Is A Mobile Ham Radio Right For You? Many new hams select mobile transceivers because they want to take their radios on the go while increasing their reach beyond what is offered with most handheld transceivers. This comes with the limitation that you can only use your radio setup when you're in your vehicle. 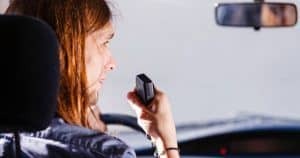 If your primary goal is to communicate with others while on road trips or when driving in your local area, then you're likely a good candidate for a mobile ham station. Look at our mobile ham radio reviews to find a mobile ham radio for your personal needs. If we had to decide purely on price point and features, we would select the BTECH MINI UV-25X4 as the best mobile ham radio for the money. It's compact, easy to use and offers tri-band functionality for a reasonable price. 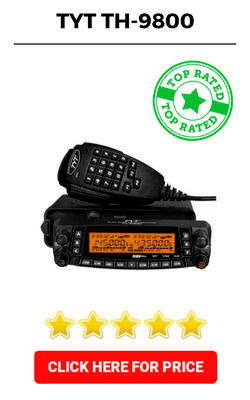 Overall, our choice for the best mobile ham radio is the TYT TH-9800. The price is reasonable, it comes with a durable antenna and it's a high-quality dual-band mobile ham radio.